Apple has been identified as a major supporter of the non-profit Magical Bridge Foundation, providing $250,000 in sponsorship for the 'Innovation Zone' of an accessible playground due to be constructed later this year in Fair Oak Park located in Sunnyvale, California. 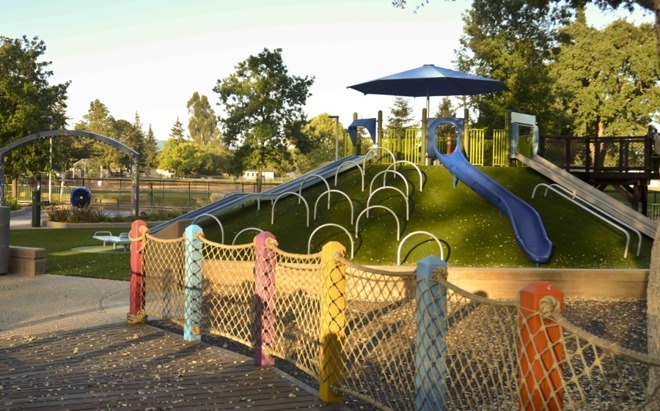 The Magical Bridge Playground will be the foundation's third, based within the 15.2-acre Fair Oaks Park to help serve the estimated 150,000 residents of Sunnyvale, as well as visitors to the area and the families of employees working for nearby tech companies. Apple's donation of $250,000 sponsors an area of the playground named the Innovation Zone, described as "a dynamic space within the Sunnyvale playground for people of all ages and abilities to meet, learn, explore, create, and build new and diverse relationships." The park's website also mentions it will provide "unique and interactive play experiences, using technology, art, and design that stimulates the full array of human senses in an entirely new way." The playgrounds built by the Magical Bridge Foundation are designed to accommodate children and adults with a wide range of physical and cognitive abilities, making it an inclusive area for all to visit. Despite shifts in culture since the introduction of the American Disabilities Act of 1990, the foundation believes public parks still do not adequately cater to visitors who are autistic, cognitively challenged, visually or hearing impaired, physically limited, or aging. "The dream to build magical spaces where people of all abilities can feel freedom of play has become a reality because companies like Apple and our other partners are so committed to this community, its residents, and visitors," said Magical Bridge co-founder Olenka Villarreal. "The joy is contagious. Magical Bridge Playgrounds are changing neighborhoods, cities, and soon, the country through truly inclusive play." The foundation intends to raise a total of $3.3 million to begin construction of the Fair Oak park playground this fall, with the intention of opening the area to the public in 2020. Aside from Apple's contribution, the list of major donations includes $1.8 million from the City of Sunnyvale, $1 million from the Santa Clara County Supervisor's All-Inclusive Playground Grant, and $150,000 each from tech companies Google and LinkedIn. Apple has a history of working to improve accessibility and inclusivity, both in its products and in raising awareness. Previous efforts include working with Cochlear to develop the Nucleus 7 hearing implant, marking Autism Acceptance Month in the App Store, and recognizing Global Accessibility Awareness Day by holding an event at its corporate headquarters featuring famed musician Stevie Wonder. In January 2017, Apple was recognized for its work in incorporating accessibility functions into the iPhone, Mac, and other devices, with the Associated Services for the Blind and Visually Impaired presenting the company the prestigious Louis Braille Award.